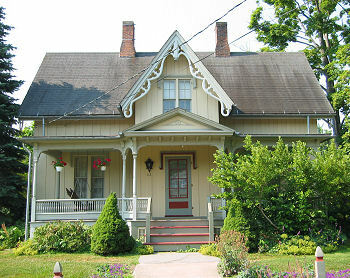 This B&B is nestled in the Village of Trumansburg, New York, in the Finger Lake Region of NY, near Cayuga Lake. Gothic Eves Bed and Breakfast offers five Finger Lake New York lodgings to our guests. Our Bed and Breakfast has five wonderful bedrooms for our guests, all with private baths. Two rooms with king size beds, one of which also has a single bed. Two rooms with queen size beds and room one with a full size bed. A full gourmet breakfast is always included. We are located between Cayuga and Seneca Lake Wine Trails, within two miles from Taughannock State Park which boasts a 215 foot high waterfall, hiking and cross-country ski trails, sledding, skating, swimming area and boat ramp on Cayuga Lake, and the Finger Lakes National Forest.